It's here! 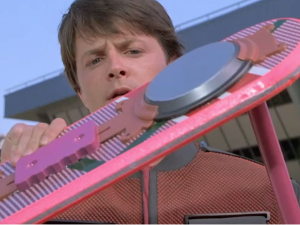 In case you didn't realize it, this year - 2015 - is the year Marty McFly and Doc went to in Back to the Future Part II. I have two words: Hover. Board. I have two more: Want. One. My husband and I watched this movie on New Years' Day and I was shocked by how much they did get right. I was also shocked by how bad the acting was in this movie! I remember the Back to the Future movies being some of my favorites as a kid, but both Marty and Doc were so over the top and animated! If you haven't watched it in a few years you should put it on your list. I hope you all had a great holiday break! It just occurred to me that nine years ago I came to work at Grace Engineered Products, and, I must confess; I knew nothing about this industry. But, I was a single mom and I needed a job, so I took the one offered to me and was grateful for it. For seven years I listened, learned and, eventually, spoke about electrical safety. I became aware of a real need for what we were doing and, being a cause-motivated kind of person, I embraced the mission of keeping workers away from live voltage. I wrote about standards relating to maintenance workers, electricians, safety, productivity and ROI. Then, two years ago, I met my husband, and he just happened to work in industrial construction and maintenance. The person I had been discussing for seven years and imploring companies to keep safe was him. Suddenly, I had a new perspective on this whole thing. We weren’t working to keep some guy safe at a panel; we were working to keep my guy safe. Safety just got personal. I share that with you in this New Year because I want you guys to know that while I started this blog as a way to communicate with our target demographic about our products, it has become so much more. It is a way for me to learn about the culture in our industry, which helps us get the message about about thru-door electrical safety. We want your business, but not for the reasons you may think. Here at Grace, we do what we do not just because it is a job - this is really a cause. We want you safe. We want you to go home at night to your family and friends. And we believe that nothing is worth working in an unsafe way. Ingenuity and innovation can trump any unsafe practice and we want to help bring those solutions to the market. With that in mind, I hope you might help me. I want to know what your safety goals are in 2015. Do you mind taking this quick, not-even-5-minute survey to help me understand where we are as a culture with regards to safety? Thanks in advance!